1. Use a typewriter, if possible, when completing this Student Enrollment Card. If one is not available, be sure to print names plainly since your students' certificates will be filled in from information on the reverse side of this card. Be extremely careful! 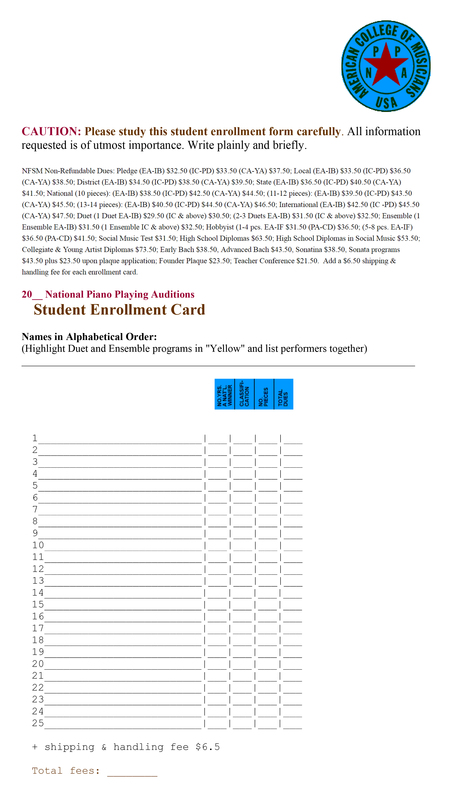 Computer-generated lists are acceptable but must be attached to the Student Enrollment Card. 3. Collect all student dues and enclose the total student enrollment fees (plus $6.50 shipping & handling fee) in one money order or check. Mail the single check with this card to American College of Musicians, P.O. Box 1807, Austin, Texas 78767-1807, preferably by February 1. Enrollments received without checks, with unsigned checks, or with post-dated checks will not be scheduled until payment is received. 4. Student enrollment begins December 1. Those enrolling before February 1 may make requests for special times. Please make these requests very brief and enroll as early as possible to increase the likelihood of being assigned your requested dates. The scheduling chairperson will endeavor to comply with the teachers' wishes whenever possible. Teachers will not be called by headquarters when their requested dates/times are not available. CAUTION: Please study this student enrollment form carefully. All information requested is of utmost importance. Write plainly and briefly. NFSM Non-Refundable Dues: Pledge (EA-IB) $32.50 (IC-PD) $33.50 (CA-YA) $37.50; Local (EA-IB) $33.50 (IC-PD) $36.50 (CA-YA) $38.50; District (EA-IB) $34.50 (IC-PD) $38.50 (CA-YA) $39.50; State (EA-IB) $36.50 (IC-PD) $40.50 (CA-YA) $41.50; National (10 pieces): (EA-IB) $38.50 (IC-PD) $42.50 (CA-YA) $44.50; (11-12 pieces): (EA-IB) $39.50 (IC-PD) $43.50 (CA-YA) $45.50; (13-14 pieces): (EA-IB) $40.50 (IC-PD) $44.50 (CA-YA) $46.50; International (EA-IB) $42.50 (IC -PD) $45.50 (CA-YA) $47.50; Duet (1 Duet EA-IB) $29.50 (IC & above) $30.50; (2-3 Duets EA-IB) $31.50 (IC & above) $32.50; Ensemble (1 Ensemble EA-IB) $31.50 (1 Ensemble IC & above) $32.50; Hobbyist (1-4 pcs. EA-IF $31.50 (PA-CD) $36.50; (5-8 pcs. EA-IF) $36.50 (PA-CD) $41.50; Social Music Test $31.50; High School Diplomas $63.50; High School Diplomas in Social Music $53.50; Collegiate & Young Artist Diplomas $73.50; Early Bach $38.50, Advanced Bach $43.50, Sonatina $38.50, Sonata programs $43.50 plus $23.50 upon plaque application; Founder Plaque $23.50; Teacher Conference $21.50. Add a $6.50 shipping & handling fee for each enrollment card.